Mini Boccone Dolce - Let the Baking Begin! 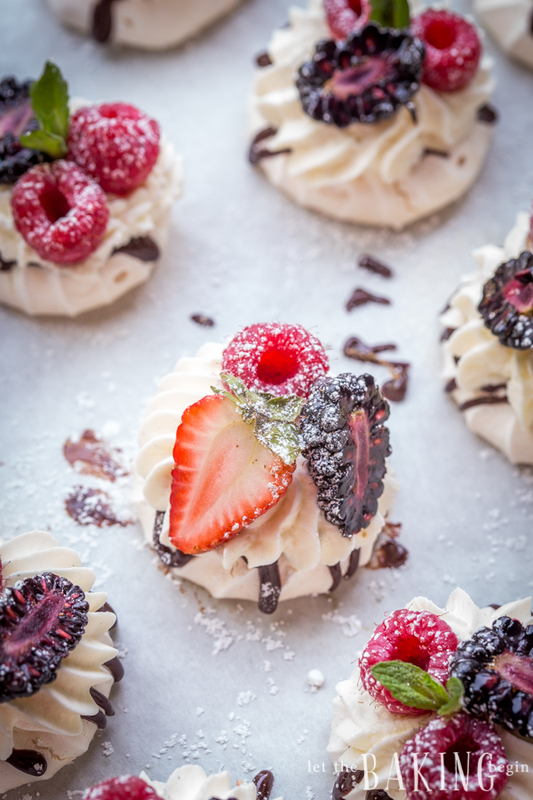 Mini Boccone Dolce – Meringue Nests filled with Vanilla Whipped Cream, Berries and Chocolate. This meringue dessert feels light and refreshing. Did I mention that it’s supper easy to make? Babies of the Boccone Dolce cake (which has quickly became a favorite for everyone who’s ever tried it) these delicate and light Mini Boccone Dolce’s are festive and amazingly delicious! It’s very hard to stop with just one, since meringue base leaves you craving for more. There are cakes and desserts that while I love eating, I absolutely hate making. This one is definitely not one of them. 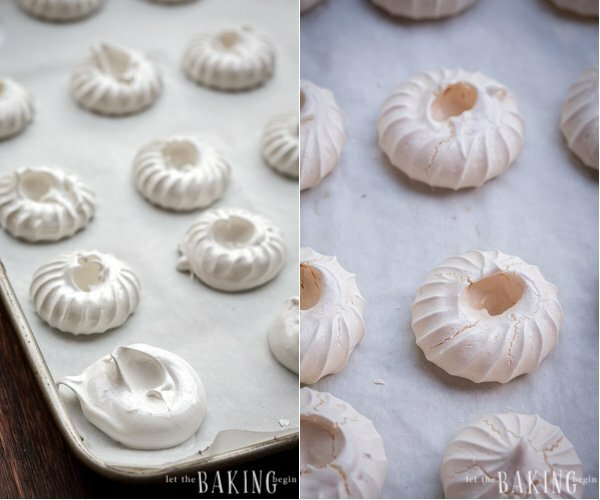 It takes about 10 minutes to make the meringue (the oven does the heavy lifting) and then after the meringue is baked it takes about 20 minutes to finish them up. The results are always awe inspiring and you can’t help but feel so proud of yourself for making something this beautiful and this good. Check out the step by step pictures below to see just how simple everything is! Preheat oven to 200F, with the rack in the middle. Line a baking sheet with parchment paper and set aside. 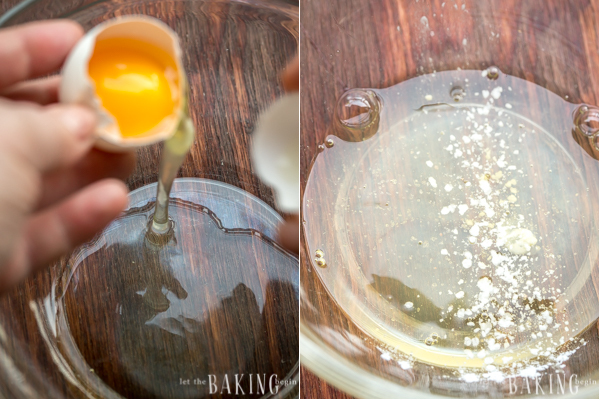 Add the 3 egg whites, pinch of salt and pinch of cream of tartar to a thoroughly cleaned glass or stainless steal bowl. It should have no traces of grease or egg yolk. If there is, the meringue will not whip properly. 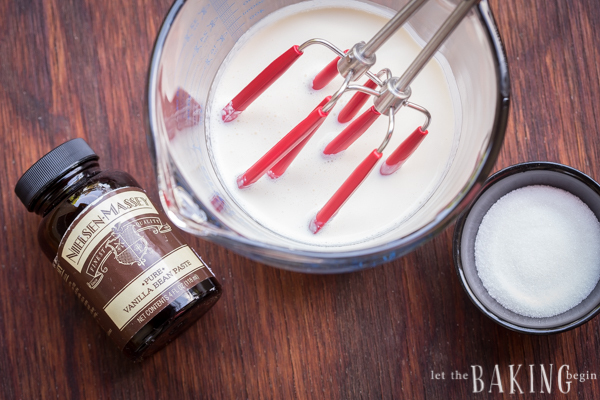 Using a mixer start whipping the egg whites until they’re slightly foamy, then add the sugar one table spoon at a time while continuing to whip. Once you’ve added all the sugar, continue whipping on high for about 5 minutes (if you multiply the recipe, make sure to multiply the whipping time as well). The egg whites should look pearly white and very thick. Fit a ziplock bag or a pastry bag with a star tip. Fill the bag with the meringue and pipe 2 inch stars about 2 inches apart. To pipe hold the piping bag about 1 inch above the baking sheet, push until a 2 inch star has been piped, then stop pushing and quickly pull up. If you don’t care for the star design, just spoon the meringue onto the sheet. 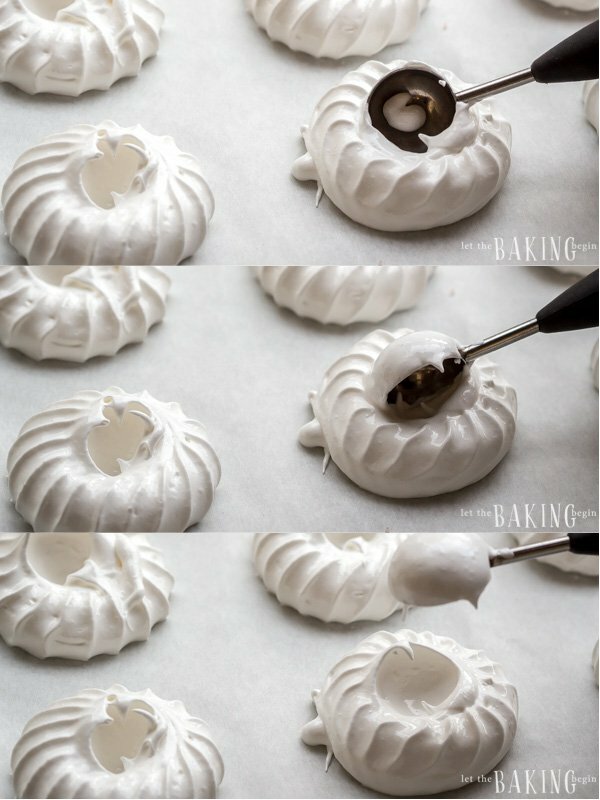 Using a teaspoon or a mellon baller, make an indent in the middle of the meringue, like shown on the pictures. Place in the oven and bake for 1.5 – 2 hours. 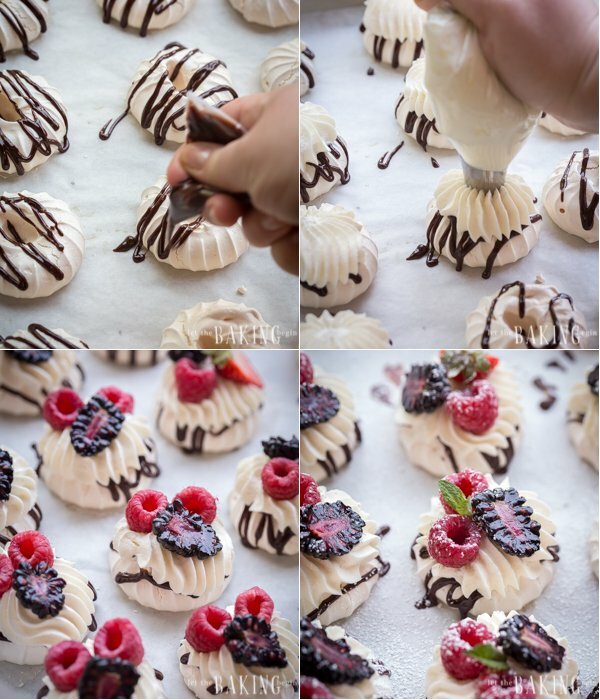 To check if the meringue is dry, remove one from the oven and let it cool completely. Now break it apart and check to make sure that the middle is not moist, but thoroughly dry. Once dry, turn off heat, open the oven door just enough to stick a wooden spoon and allow to completely dry. 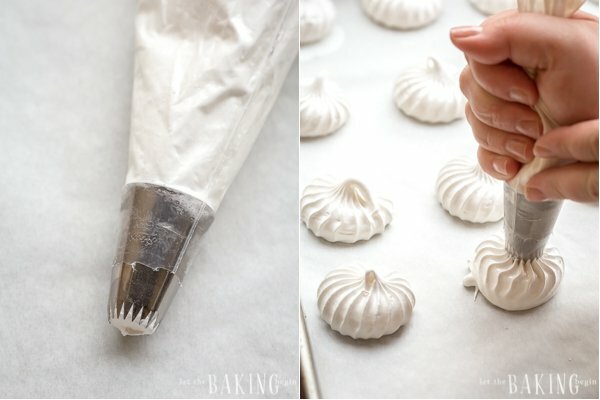 Meringues can be made several days ahead of time, just make sure to keep them in an airtight container until ready to assemble. 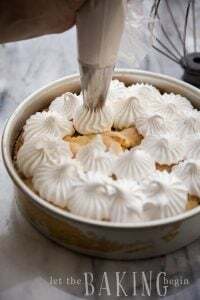 Add all ingredient (1 cup heavy whipping cream, 3 tablespoons sugar, 1 tablespoon vanilla extract/emulsion) to a bowl and whip with a mixer until medium-peaks, about 1-2 minutes. Fit a ziplock/pastry bag with star tip. Fill the bag with prepared cream. 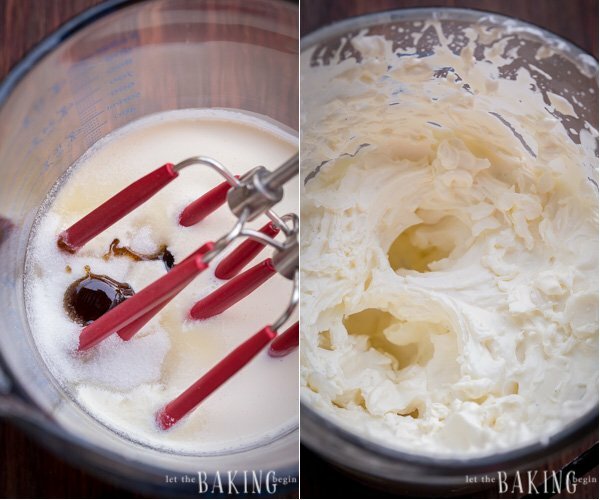 Pour heavy cream over chocolate chips, let sit for 2 minutes. Stir until smooth. Transfer to a ziplock bag. Snip off a corner of the bag. 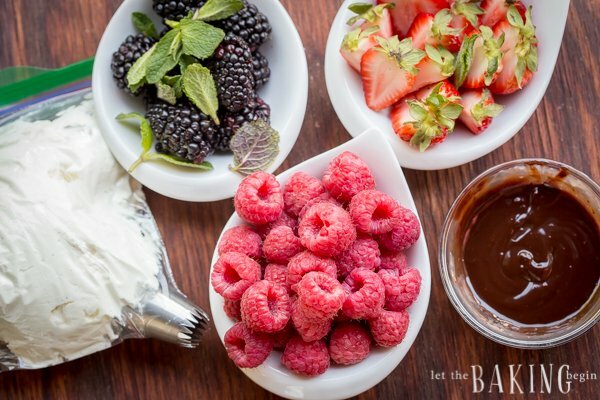 To Assemble gather the rest of the ingredients together to assemble the Mini Boccone Dolce’s. You will need about 2.5 cups of berries of choice. Drizzle chocolate ganache over each meringue nest. Pipe a star with the Vanilla Whipped cream. Top with a couple berries and a mint leave for garnish. Refrigerate until ready to serve. Can be made up to 12 hours ahead, but best served within 2-3 hours of assembly. 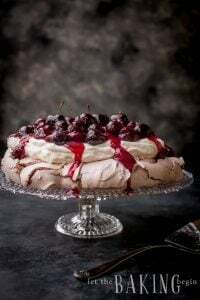 Cherry Chocolate Pavlova Recipe – Meringue dessert topped with whipped cream and cherry sauce. 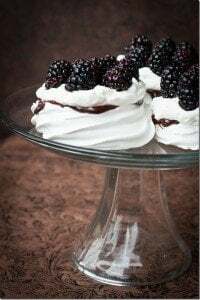 Pavlova Cake Recipe – Fluffy and soft meringue cake with berries and sweetened whipped cream. Using a mixer start whipping the egg whites until they're slightly foamy, then add the sugar one table spoon at a time while continuing to whip. Once you've added all the sugar, continue whipping on high for about 5 minutes (if you multiply the recipe, make sure to multiply the whipping time as well). The egg whites should look pearly white and very thick. If you don't care for the star design, just spoon the meringue onto the sheet. Place in the oven and bake for 1.5 - 2 hours. To check if the meringue is dry, remove one from the oven and let it cool completely. Now break it apart and check to make sure that the middle is not moist, but thoroughly dry. Once dry, turn off heat, open the oven door just enough to stick a wooden spoon and allow to completely dry. 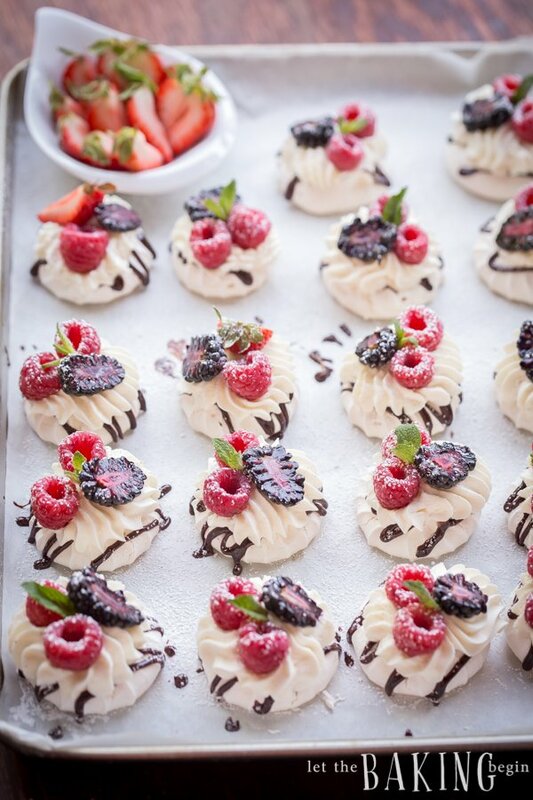 Gather the rest of the ingredients together to assemble the Mini Boccone Dolce's. I never thought I could make these by myself. Your clear/precise instructions with pictures made me step out of my comfort zone and attempt this! The results were amazing!!!! Thank you! Can’t wait to try your other recipes. 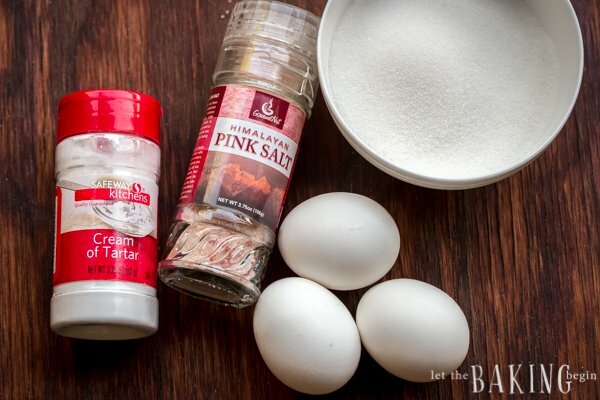 Already using many of your suggestions in everyday cooking/baking. Thats amazing! Thanks so much for your feedback! Will the baked meringue hold well if frozen in air tight container for few days prior to holiday prep? These were soo yammi! I made a trial at home and they were gone in one day. My 5 year old requested them for her birthday party, They were a hit, everyone loved them, kids and adults including. Perfect size. Thank you for sharing! 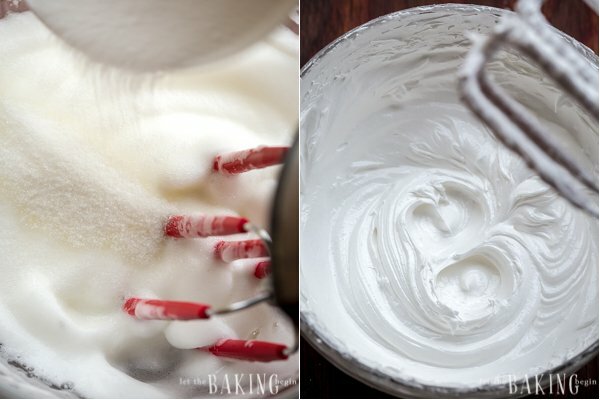 Do egg whites have to be at room temperature before whipping? I have used both room temperature and eggs straight from the fridge with success. So either one will work. Wow! These look amazing! 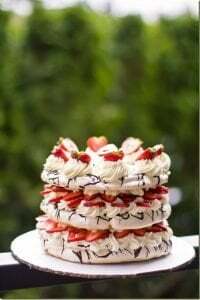 I love that they are mini, perfect for parties 🙂 i ordered the boccone dolce cake at papa Haydn for my bday last month and it was so hard to cut, it was falling apart. I love how these are perfect size and no need to cut into slices. I will be making these soon 🙂 Love all your recipes. You’ve got some talent Marina!!! Yes, this is why I like to make the Boccone Dolce in one layer, because it is so much easier to cut and serve. 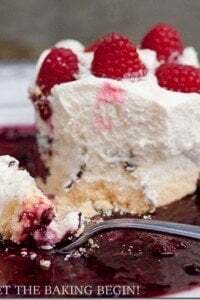 Also, if you let the cake sit (in the fridge) for a couple hours before serving, it will be easier to cut it, because the meringue layers absorb some of the moisture and make it softer. Of course, to avoid the hassle you could just make these mini versions 😉 Thanks for your kind words dear! 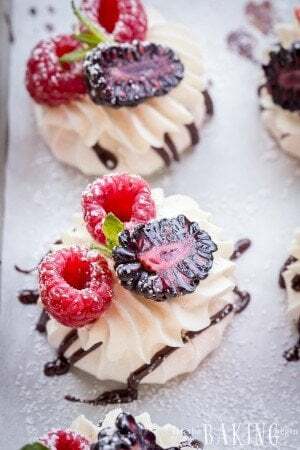 Generally for meringue it is best to use finer kind of sugars, so even using the granulated (regular) sugar is probably not as good as using powdered sugar, even though it does work. So what I would do if I was you, is probably either run the organic white sugar through your blender to break the crystals into finer crystals, or just use 1 3/4 cups powdered sugar for every 1 cup of sugar in the recipe. Good luck dear! I love these as minis. So smart!! Your photography is stunning as usual! Beauties! You’re amazing, Marina!!! If only I could be half the baker you are!!! Thank you Zhenya! This really isn’t that hard though!